An intriguing phenomenon in literature and arts. A maverick professor's quest to find answers. And a discovery that will shock the world. Books, TV, film, advertising. It’s all being mysteriously altered, and no one knows why. Dr. Harriet Sterling claims she understands, even if no one believes her. She calls it the New Phenomenon of Bleedover. She's alone, though, because the science establishment stands in her way. When trusted graduate students generate an apple out of thin air in a controversial bleedover project, the world takes notice. So does an old enemy thirsty for revenge, Corbin Lyell, who manipulates bleedover to hurtle monstrosities from the world of his pulp heroes, H.P. Lovecraft and R.E. Howard. Dr. Sterling must stop Lyell's apocalyptic plans, but with enemies on all sides undermining her discovery, can she succeed? 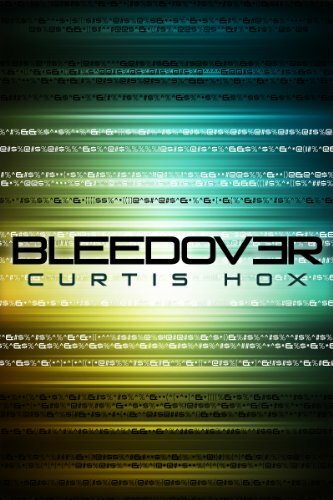 With a heady mixture of serious literature and genre fiction, Bleedover dazzles as a thought-provoking work of science fiction and contemporary fantasy that both inspires and entertains. Curtis Hox scribbles science fantasy novels. He's written six unpublished novels, which include his debut science fiction novel Bleedover and the forthcoming YA Transhuman Warrior Series.Other titles by Curtis Cox include Repossession in Progress ,The Kafka Harrier,The Red Sphere. I'm pretty picky about my sci fi, however when I find a god one, I tend to really love it. Stephenie Meyer's The Host is my favorite sci fi. Thanks for offering a giveaway!!! My favorite sci-fi book is The Hitchhiker's Guide to the Galaxy. I don't have a favorite sci-fi book. I like some Sci-Fi books. My favorite "Sci-Fi" Genre is Fantasy. I like JR Tolkein, CS Lewis, JK Rowling, Suzanne Collins. i love sci-fi a lot, but also young adult and fantasy. then there is steampunk - it seems really interesting.